Radiofrequency ablation for back pain may be the best treatment for you if you haven’t responded to other, less invasive techniques. Your NYC back pain doctor often relies on lumbar radiofrequency ablation to treat chronic lower back pain when surgery isn’t an option. The radiofrequency ablation procedure is performed in your Midtown Manhattan pain management doctor’s office and can lead to pain relief that lasts for years. Make an appointment today in our NYC sports injury clinic to get your pain evaluation and treatment. Radiofrequency ablation, like the name infers, is a procedure that relies on electric current and radio waves to produce enough heat to significantly disrupt the normal flow of the pain and sensations that flow through your nerves. Radiofrequency ablation for back pain is the most common use for the radiofrequency ablation procedure by your Midtown Manhattan sports medicine and pain management doctor. Whether your back pain originates from an injury or facet joint problems, radiofrequency ablation may be your best bet for reducing and even eliminating your pain. The procedure also works whether your back issues stem from neck pain, shoulder pain, upper back pain, middle back pain or lower back pain. The radiofrequency ablation procedure is minimally invasive. It’s delivered by way of a needle, like an injection. This nerve block procedure is an ideal solution if you’ve suffered from chronic pain lasting more than six months. The relief you get from radiofrequency ablation for back pain can last for up to 12 months, although many people get relief from back pain for years following a lumbar radiofrequency ablation. The radiofrequency ablation for back pain treatment is performed in your New York City doctor’s office, and like many injections to treat pain, your doctor relies on fluoroscopy to guide the injection. Fluoroscopy, or real-time x-ray imaging, provides your doctor with sufficient guidance on where to place the needle. You’re given a low-dose sedative to relax you. The skin is cleaned where the injection is planned. Your physician places a numbing agent onto your skin, which may sting for a few moments. 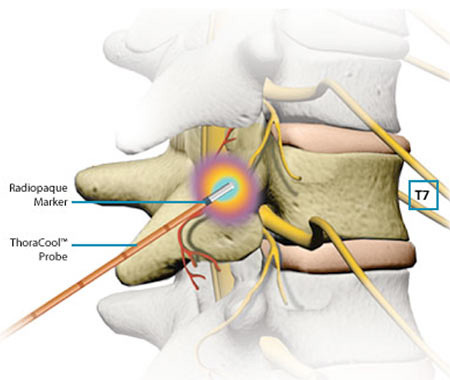 The radiofrequency needle is inserted and guided to the proper point. A tiny amount of electricity is shot through the needle at first to make sure your doctor has the needle placed correctly. A muscle twitches when it’s been hit with the impulse. The nerves then are numbed so that you won’t feel the pain of the heat. The heat creates a small lesion to put a stop to the pain. Additional nerves are treated during the same treatment period if necessary. Although you can usually return to work and your normal activities the next day, your pain management team recommends that you don’t drive for 24 hours. And you’ll need a ride home from the office. You’ll probably be a little sore for about a week, though ice packs help relieve this discomfort. Build a relationship with your sports medicine and pain management team at the Sports and Pain Institute of NY — they want to ensure that you get the most effective treatment for back pain. Athletes who suffer from chronic injuries, executives on the go for days on end and older New Yorkers suffering from age-related wear-and-tear conditions appreciate the pain relief they get from the radiofrequency ablation procedure. It’s likely that you’ll have to return for follow-up injections, or touch-ups, within about three weeks if your pain is not fully abated. This procedure isn’t permanent so you need to maintain regular visits to keep up the relief. Do you have any questions about the radiofrequency ablation therapy for back pain we offer in NYC? 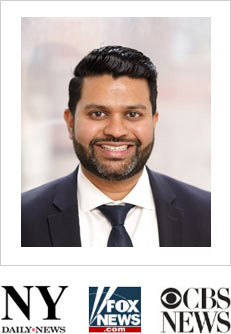 Would you like to schedule an appointment with the best rated back pain doctor Febin Melepura MD of sports pain center in New York City? Please contact our office for consultation with the top pain relief specialist in Midtown Manhattan.